Tonight Lisa made a dish that’s just a slight variation on the ‘Seafood “Dirty” Rice’ in Great Bowls of Fire. 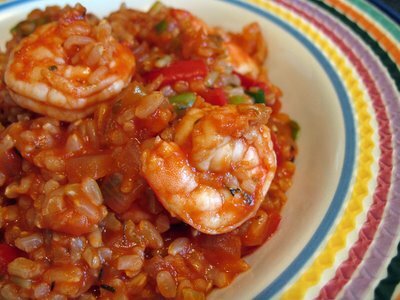 The main difference was that while that recipe called for a mixture of shrimp and scallops, Lisa used all shrimp, and she also replaced the white rice with brown. It was very flavorful, and the shrimp stayed juicy and tender. The recipe below is with those modifications. In a large saucepan, heat the oil. Add the onion, bell pepper, celery, and garlic and cook, stirring, for 6 minutes over medium-high heat. Stir in the tomato puree, water, oregano, thyme, salt, white pepper, and cayenne pepper and bring to a simmer. Add the shrimp and cook, stirring, over medium heat until they are opaque, 10 to 12 minutes. Stir in the milk and return to a gentle simmer. Fold in the cooked rice, green onions, and hot sauce. Spoon into shallow bowls and serve while piping hot. This entry was posted on Thursday, August 2nd, 2007 at 9:28 pm	and is filed under Great Bowls of Fire, Main Dishes. You can follow any responses to this entry through the RSS 2.0 feed. You can leave a response, or trackback from your own site.